Seated in the quiet dining room of Vertical, located on the third level of First Canadian Place, the overlooking view of the elevators provided an interesting people watching vantage point: a glimpse into their lives before rushing off to other destinations following work. The last time I’d been to the restaurant was years earlier, for lunch, a failed pomegranate kale salad that was too seedy and tart to be satisfying. If it weren’t for That’s The Spread and winning a gift card from their online contest, I may have never returned. And that would be a shame as the dinner menu by Chef Pasquini is good – Italian based dishes that are a far cry from the salad of the yesteryears. 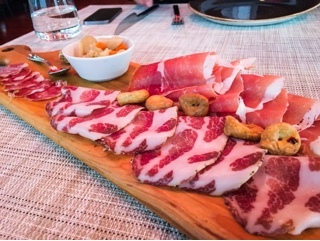 Plenty of thinly sliced finocchina, capicollo, and 24-month aged prosciutto di parma were given in the assorted salumi ($20), a starter that’s great for sharing. The finocchina, a Tuscan salami, was a tad fatty for me but was luckily my husband’s favourite. The leaner neutral capicollo was a better bet and we both enjoyed the prosciutto, which was flavourful without relying on salt. Accompanying the meat was a small bowl of crunchy pickled vegetables and great grainy mustard, though what it really needed was bread or crostini. After referring back to the menu for the post, I now realize you can request complimentary ciabatta; a reminder from our server would have been nice as I’d certainly would have benefited from one. 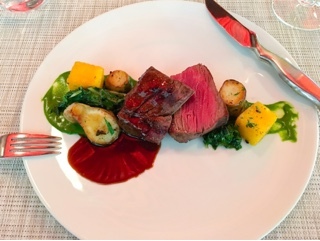 My main, a beef tenderloin ($42) was a thick chunk and well prepared – a good sear and left medium rare inside. The splash of salsa verde studded with Jerusalem artichoke, over salted swiss chard and cubes of deep fried polenta made for a beautiful spring-coloured presentation. Although their mains do have garnishes, it’s not substantial so you’d likely need a supplementary side. 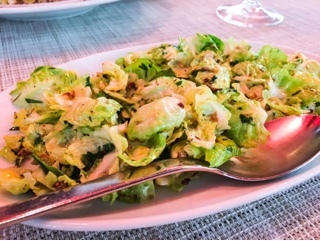 We shared the brussel sprouts ($9) which were simply tossed with a good quality olive oil, lemon and a hefty portion of garlic. 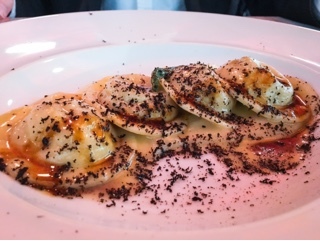 The ravioli ($25) were deliciously filled with a smooth parsnip puree mixed with shredded braised short rib and then garnished with a dusting of scorzone black truffle, which goes so well with the creamy sauce. Given the main courses were rather small, we certainly had room for dessert. The warm doughnuts ($10) were a great way to end: six plump soft pastries that were thankfully not oily. 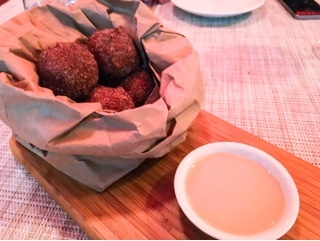 The coffee dipping sauce was rather weak and could benefit from a bit more espresso, but the doughnuts had enough cinnamon sugar coating them that they were tasty on their own. As a warning, the portions at Vertical certainly don’t follow the Italian tradition of abundance. Nonetheless, after the dessert, we were satisfied without feeling overly stuffed. The dinner was much better than my last visit. After all, I’ve finally learnt Homer’s lesson – you don’t make friends with salad.